Aqaba and Petra, Jordan – Spectacular! 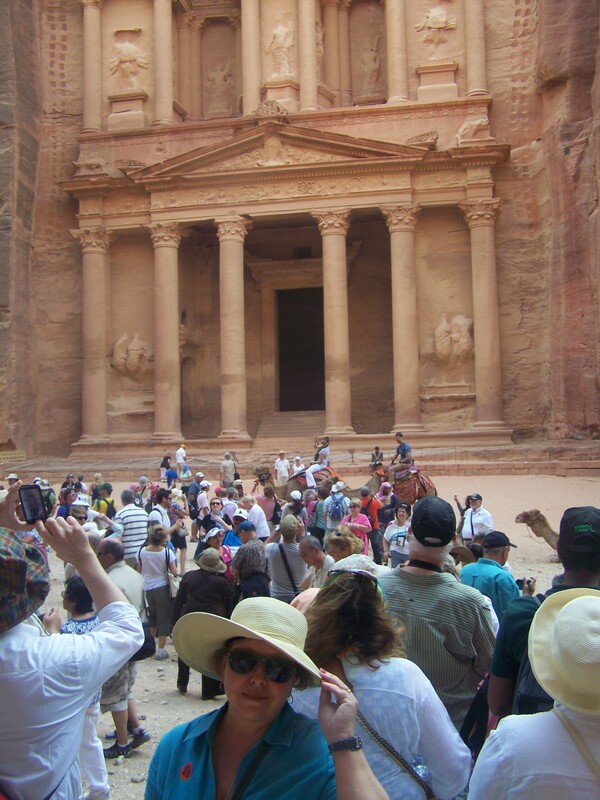 The crowds of people, camels and vendors swarmed in front of The Treasury — favorite site in Petra! When we entered the Port of Aqaba, Jordan, this morning there was no way to know the excitement awaiting us at the end of a 2-hour bus ride. Our tour guide said that Aqaba is referred to as Ayla in the Bible and it is part of the Holy Land. Today, it is best known as a sea resort town with phenomenal snorkeling and diving locations. Can you believe its ancient origins date back to 4,000 BC? Many cultures have passed through, including the Ptolemies of Egypt, the Nabateaeans of Arabia, the Romans, Muslim pilgrims, the Crusaders and many more. Thankfully, we had very pleasant weather for the trek up and down a steep hill in and out of the siq at Petra. The magnificent treasures that awaited us around every bend were well worth the long walk. In the end, we decided to pay for a horse and buggy ride partway back up the mountain. One could also ride by horseback, as well as take a short camel ride, which were optional. 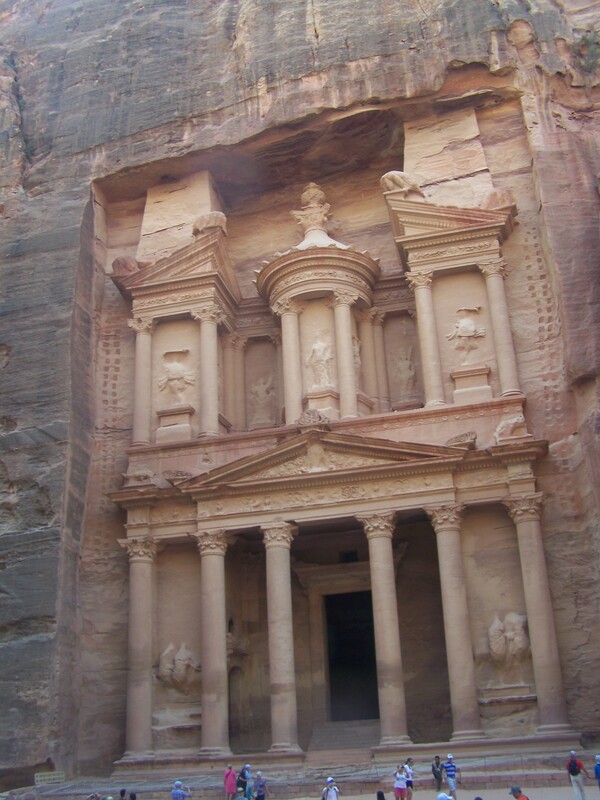 Neither words nor photos can do justice to the fascinating, ancient site of Petra. Hidden between 300 ft. high solid, rose red rock walls are the tombs of the ancients. One tomb in the vicinity is said to be the tomb of Moses’ brother, Aaron. What are so incredible about this site are the facades of buildings carved into the solid rock walls. Most impressive of these were the Temple of the Four Obelisks and, especially, The Treasury site with four enormous pillars. This particular rock carving is said to have taken many years to complete, working from top to bottom. We spent the day looking up, as we meandered between the high rock walls, not believing what a magnificent hidden fortress this had been, serving so many in keeping safe the remains of their leaders, their treasures and preserving their customs. There are no dwellings at this site, which still harnesses many secrets, as the stories we hear are, for the most part, just theories. A scene from the last Indiana Jones movie was shot at Petra, and sure enough there is an Indiana Jones storefront on the way to the siq. Many souvenir vendors hawked their wares but were not as intolerable as the ones in Cairo at the Pyramids of Giza or at the Valley of the Kings in Luxor. It’s a matter of learning to ignore and to be aware of their conning tactics. We had an excellent buffet lunch at the Movenpick Hotel in Petra, including excellent local dishes such as baby lamb. I don’t eat lamb, but I did try a bite and found it to be tasty, along with samplings from many exotic dishes. The dining room of the hotel is especially charming with mosaic tiled ceiling and wall decor. Loved the atmosphere there! I could go on and on about Petra, but my blog on this topic must end here. The Mariner of the Seas is now headed for Dubai, and we will be doing our pirates drill in about an hour in preparation. 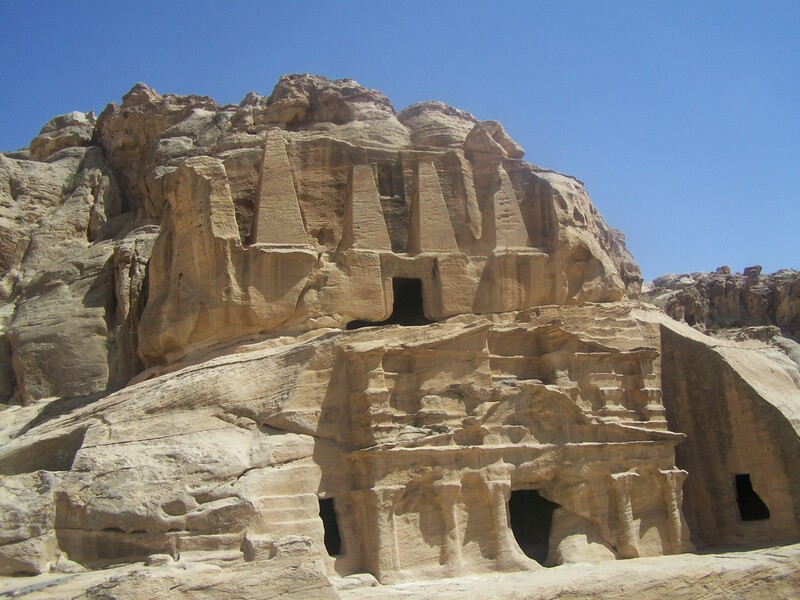 The Treasury was carved into the solid stone mountain at Petra thousands of years ago! ← Gateway to treasures of ancient Egypt — Safaga! This is great sis!!! So happy for you two!